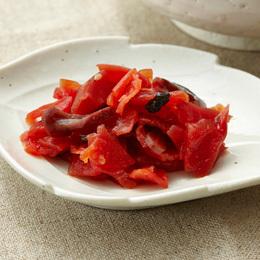 Pickles, known as tsukemono in Japanese, are a popular side dish, bar snack, and garnish. Traditionally, pickling was a technique implemented to preserve vegetables for weeks and months after picking. Nowadays Japanese pickles are an important part of Japanese cuisine. Here in the UK, the word 'pickles' evokes memories of tiny pickled onions and gherkins at cocktail parties, childhood sandwiches filled with cheese and pickle relish, or sides of pickled red cabbage for enjoying with sausages and mashed potatoes. All of these pickles are notorious for their strong and often very sour flavour. Japanese pickles, on the other hand, tend to boast a more subtle taste that varies in strength and distinction of flavour depending on the vegetable/s and the composition of the pickling solution used. Japan Centre is well stocked with Japanese pickled vegetables, and whether you prefer pickled cucumbers, pickled radishes or pickled garlic, flavoured with anything from miso to honey to matcha green tea, we are sure to have something your taste buds will thank us for. We also have a great collection of Japanese pickle recipes, where you can discover that the secrets to pickling cucumbers, radishes, ginger and other vegetables are not nearly as difficult to master as you may think. One important element in Japanese cuisine is harmony; where the elements of dishes are counter-balanced against each other. Tsukemono help to balance rich or plain flavours by adding sharpness. Colour is also essential for dressing and elevating the plate, and colourful tsukemono pickles are very suited to that job as well. A tart pickle normally made from mooli radish, this is commonly used with curries or to accompany side dishes such as onigiri rice balls. Named after the Seven Lucky Gods in Japanese mythology, these pickled radishes are usually bright red or yellow, and deliver a fantastic bitey texture. Possibly the most ubiquitous of all Japanese pickles, pickled ginger is usually found accompanying a tray of lunchtime sushi, along with a sachet of soy sauce and a dab of wasabi paste. Light and delicate at first bite, these paper-thin pink slices of ginger soon warm up on the tongue. But they are nowhere near as fiery as when in their raw incarnation. These Japanese pickled plums are often attributed to curing hangovers, no doubt due to the intense salty/sour kick they deliver. Should you find yourself ever feeling delicate, one of these pickled plums popped into the mouth will bring you to your senses in no time. A pickle made from daikon mooli radish, takuan is one of the most traditional pickles, typically eaten at the end of a meal to aid digestion. 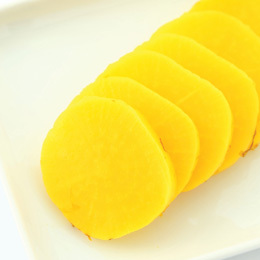 Usually yellow in colour, these pickled radishes has a distinctive half-moon shape when sliced, and is a great accompaniment to any savoury Japanese meal. 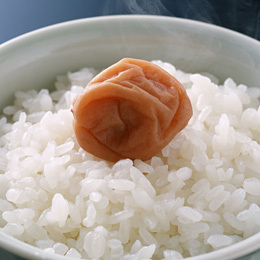 Asazuke refers to a pickling method where fresh vegetables are bathed in a vinegar solution for around half an hour. Requiring a shorter fermentation time, this style of pickling allows the vegetables to retain more of their fresh taste and lessen some of the pungency of other pickle varieties. Although any vegetable could be pickled this way, we suggest pickling cucumbers, daikon, aubergines, or Chinese cabbage (hakusai). Crisp and delicious, this is a flavourful way to serve vegetables. Made by fermenting vegetables in rice bran, this pickling technique results in pickles that vary in taste from pungent, to sweet, to sour. The process of pickling in rice bran allows nukazuke pickles to remain relatively crisp. 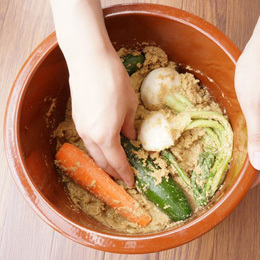 Nukazuke pickles are said to help with digestion, and although vegetables like daikon, cabbage, aubergine, and cucumber are most typically pickled in rice bran, people even sometimes pickle meat and fish with this technique. Mori has specialised in pickled Japanese products since 1962. Mori are unique among pickle manufacturers in that they frequently utilise a range of different pickling agents and flavourings, including miso, sansho pepper, and matcha. Whether you like your pickles sour or mild, you're sure to find a flavour you love with Mori. ShinShin is one of Japan’s most accomplished producers of pickled condiments. Their products include varieties of pickled daikon radish, garlic, and cucumber. Bursting with flavour and freshness, you can expect to have an enjoyable meal with a side dish of ShinShin pickles by your side. Discover why the Japanese love curry so much with this easy-to-make pork katsu curry recipe. A creative combination of flavours and textures, pork katsu curry consists of a crispy pork cutlet cut into long strips and served with thick, flavoursome Japanese curry sauce and a side of rice. At Japan Centre, we are pleased to be able to offer you a wide range of delicious and authentic pickled vegetables and spices. Whether you prefer the fiery flavour of pickled ginger, the refreshing bite of pickled radishes, or the salty/sour taste of pickled radishes, there is bound to be a pickle here that you will adore. Explore the wonderful world of tsukemono with us. Pickles are an indispensable part of a traditional Japanese meal. Whether you are having fukujinzuke with your curry, a pickled plum in your bento lunch or some ginger with your sushi, pickles are the finishing touch to any savoury Japanese meal. Read on to learn about some of our favourites.